Need to find out about Afterpay? New Living Australia is now offering you Afterpay, a simple interest-free payment plan. It’s like lay-by except you get to shop and take home your purchase, then pay later. You pay in instalments every 2 weeks for 4 weeks. You place your order with New Living Australia in the usual way and when you get to the checkout you select the Afterpay option. It’s that easy. If you are new to Afterpay you will be asked to provide your email address and credit card details. If you already have an Afterpay account you can login to use your existing credentials. Afterpay is available for purchases up to $1,000. 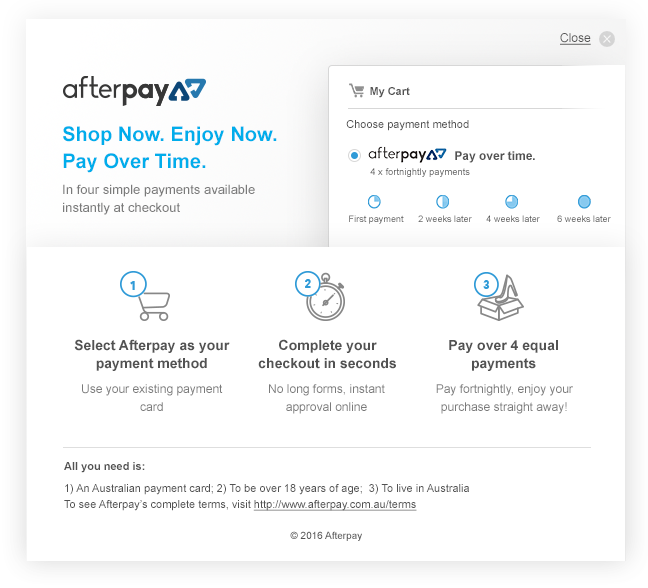 For full terms and conditions about Afterpay please see afterpay.com.au/terms.